To stand a fighting chance of making a permanent change to the way you eat, we’d recommend equipping your kitchen with a powerful VonShef UltraBlend. The UltraBlend is your key to a dazzling world of fresh flavour, that’ll help redefine what ‘healthy eating’ means to you. Get your ‘5 a day’ - The NHS recommends eating five 80g portions of fruit or veg a day - that’s 400g in total! If the thought of consuming nearly half a kilogram of fruit and veg every day seems a little daunting, smoothies and juices are a great way to get it all out of the way in one delicious go. Better still, you can add all sorts of vitamins, protein powders, superfruits, seeds, nuts and more to your smoothie for a superpowered nutrition boost. Add whole grains to your diet - The VonShef UltraBlend Smoothie Maker packs an impressive 1000W motor. With that kind of pulverising power, you can throw any ingredients into the mix to get the blend you want - even tough ones including nuts, seeds, grains and even ice! The flavour combinations are endless, and you’ll have so much fun experimenting with new recipes and perfecting your favourites. Enjoy a quick & healthy breakfast - With sharp stainless steel blades that spin at a blisteringly fast 25,000rpm, the VonShef UltraBlend turns your ingredients from solid to smooth in a matter of seconds - perfect for anyone with a small window of time to prepare breakfast. Bonus tip: enjoy smoothies even faster by storing ingredient portions in your freezer. Make homemade soup - It may be a smoothie maker by name, but this blender is perfectly suited to blitzing vegetables and other savoury ingredients into smooth, delicious soups. Wild mushroom, leek & potato, thai red butternut squash - there are so many possibilities, and all of them are more nutritious and delicious than pre-packaged supermarket alternatives which often have high salt content. 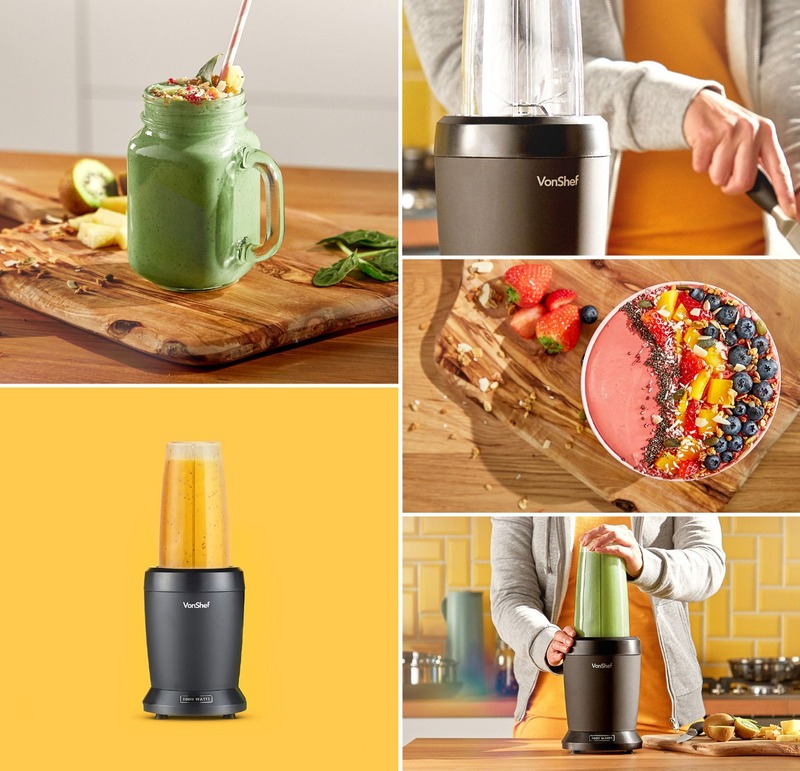 Blend and go - Blitz your ingredients in the 800ml blending cup, then detach it and enjoy your smoothie on the go with the sip and seal lid, saving you time and washing up. Need to make a larger portion to enjoy later? Use the 1000ml blending cup complete with spill-proof lid. For total convenience, each of the cups are dishwasher safe.